"We purchased FlockFiler Lite just before the first of the year and I LOVE IT!!! With more than 50 lambs on the ground already this season this software is a LIFESAVER!...I love your software and don't know what I'd do with out it." 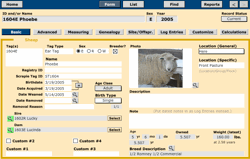 FlockFiler is a computer database for keeping health, management, and breeding records of sheep. FlockFiler Lite 2.3.0 is now available (Nov 5, 2018). FlockFiler Pro is much more comprehensive than Lite. The Pro version adds features to help you analyze and optimize your operation. Learn more. FlockFiler Pro 1.3.0 is now available (Nov 5, 2018). Store a wide variety of information about your sheep. Search on anything that you type in and in any combination. The pedigree is calculated and displayed automatically. FlockFiler has full import and export capability of all information. to upgrade from FlockFiler Lite. Download and use FlockFiler immediately. Supports Windows and Macintosh natively. Test drive the full demo before you buy. Why put your records on a computer? Why use it and not a spreadsheet? What makes FlockFiler the best? Learn more about FlockFiler Lite. FlockFiler.com has been selected as one of the "Gems of the Internet" on G4TV. Featured on a national US cable network broadcast (June 27, 2005), it is the only sheep software website to receive this honor.